Head Over Heels About Gymnastics is a child friendly book that provides step-by-step instructions and top tips explaining how to perform a large variety of gymnastic floor skills via simple language and eye catching photography. This book is a must-have for budding gymnasts of all ages and abilities, covering many different elements of the sport from balance to strength, flexibility, co-ordination, speed and control in addition to positive body awareness. 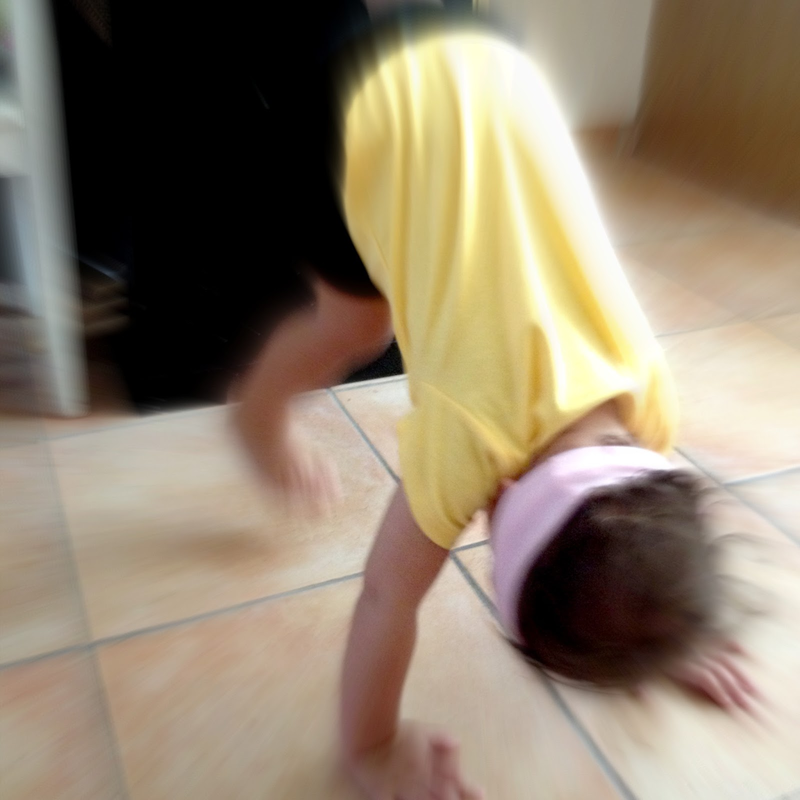 The book begins with example warms-ups and stretches, moving on to cover posture and all basic gymnastics shapes, which are instrumental in performing more complex skills. These skills are then covered in the next sections; Jumps, Skills, Rolls and Leaps. Bringing all of these skills together, the book then demonstrates how combined, these skills can be used to create routines. I didn’t waste any time and introduced this fantastic book to my little Funky one. At 19 months, I was a little apprehensive letting her handle the book. If you’ve seen any of the books we have in the house, you would be too. She was so excited because I was excited and handled this lovely flip book designed awesomeness with the upmost care. From beginning to end, this book was a joy to watch her follow along with the pictures. Pointing to the pictures to say “pike” and “strahell” (straddle). I should have taken video for grandma because it was so darn adorable. There’s the end of the Momma brag and now back to training. After all, she’s has 15 years for 2028! Oh, that’s how it’s done! I LOVED every part of this book from a professional standpoint. The author, Gemma Coles, does a fantastic job of making directions clear with regards to safety. The pictures are superb and the design is fantastic. A parent can easily help their child achieve these gymnastics exercises and shapes in the comfort of their own home. It also gives these great tips to transform any parent into a knowledgeable facilitator of movement. Do you have any gymnastics books to help teach your little ones?